Thank you to all contributors for choosing to work on SendGrid’s open source projects. We are always astonished by the enthusiasm of the open source community around the world. Especially, when T-shirts are on the line. From Spain, to Romania, Australia to India, Finland to Mauritius, we are sending T-shirts to almost 200 contributors across to globe. Found a lot of fun in contributing to open source projects! Today I received some #hacktoberfest swag from @sendgrid, thank you guys! This year’s results have been incredible. We had over 1,500 pull requests from the community and Gridders. Among our documentation repository, libraries, and other repositories, we had 343 contributors. Since we allocate difficulty levels for issues and PRs, we use story points to convert effort into statistics. The community contributed over 3,200 story points, which more than doubled per contributor from 2017. Our documentation repo also made it into the leaderboard on the official Hacktoberfest site. We also want to thank those teams that hosted Hacktoberfest meetups. 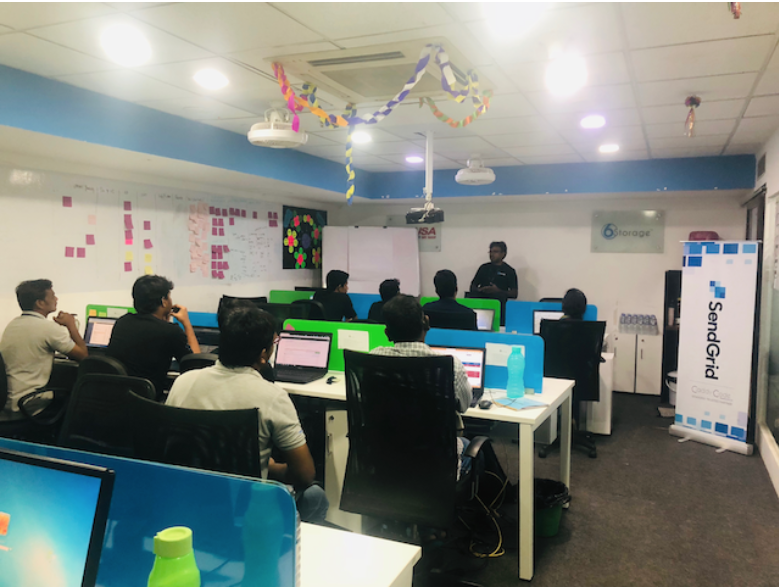 A few highlights include a Write The Docs meetup hosted at SendGrid HQ, our very own beer club (yes that’s a thing here), and Caddy Code in India. Updates to our DX Automator to use the GitHub v4 API. This will make it faster for our DX team to find and respond to issues. Changelogs are now generated automatically, which will help us release libraries faster (there are similar ones for the other repos). Publishing library releases into language package managers like this C# library contribution. For Java lovers, you can take advantage of this new concurrent class for sending email more efficiently. We tried a new thing this year to spur innovation in our community by creating a dedicated Hacktoberfest repo. And, the community generated new ideas here. Because of you, customers can now take advantage of sending email via PowerShell and R.
Looking beyond Hacktoberfest 2018, we plan to rename and re-purpose this repo as a general purpose SendGrid open source repository. We hope the community will continue to share great ideas with each other there. Finally, a special thanks to Digital Ocean, GitHub, and Twilio for sponsoring Hacktoberfest 2018, and raising the visibility of open source to new levels. Ashley Roach is a Principal Product Manager for Developer Experience at SendGrid. Previously, he was a Principal Engineer Evangelist for Cisco's developer relations team, DevNet. He has spoken and led workshops at many Cisco and 3rd-Party conferences. Prior to DevNet, he was a Product Manager in Cloud Collaboration working on APIs and XMPP technologies. Before Cisco, he was Product Manager at NewsGator Technologies, where he initiated the Social Sites product, the leading social software integration with SharePoint at the time. Before NewsGator, he joined Jabber, Inc. in 2003 where he was the Product Manager for the Jabber XCP server and launched the JabberNow appliance. Ashley holds an MBA from the University of Colorado Leeds School of Business and Undergraduate degree in History from the University of Pennsylvania. When not hacking on APIs, he enjoys playing guitar at blues jams around Denver, snowboarding, and camping.